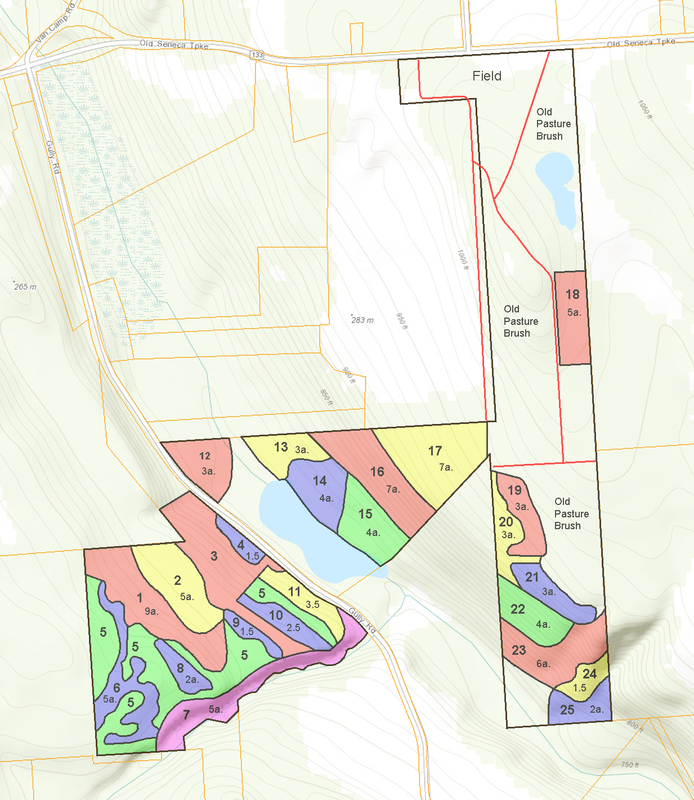 Since that time, the Gully Road area has expanded by more than sixty acres, and it’s not clear whether “long-term sustained timber income” is still as much of a priority. But the plan does provide an insight into the type forest that the conservation area has, and also shows us how the area has changed in a relatively short amount of time. Most of what follows is Mr. Porter’s stewardship plan. Editors notes are listed at the end and shown in brackets within the text. The property is located on the Gully Rd. and on the Old Seneca Turnpike about 2 miles northeast of Skaneateles. This 201 acre property is a 58 acre abandoned dairy farm which has reverted to forest and 143 acres of a former USDA agricultural experiment station. Part of the former Federal property was separated out and is now the Town ‘s Transfer Station. In properties like this which will be forest again, there is a serious problem for the future in that there is no seed source for many forest tree species. Nature will eventually fill the voids but it will take 100 years. Cattle are preferential grazers. They browse on certain species like sugar maple so heavily that they eliminate those species. The fence lines protect seedlings from grazing and sometimes farmers left large trees for shade for the cattle. In the old fields on the northeast part of this property the trees to conserve and not cut for firewood are sugar maple, white oak, and hickory and beech. There are probably some of these in the fence rows. These species are needed to help make a healthy, diverse, and valuable forest for the future. Since the pioneer tree species have not completely taken over the old meadows yet, there is still an opportunity to reforest parts of the property for aesthetic, recreational, wildlife, and timber supply purposes. There is a designated wetland on the property. Generally, forest management activities are exempt from the law, however, road building (placing fill in a wetland), drainage activities, or building dwellings within 100 feet of a wetland all require permits. This area is posted as a Ducks Unlimited cooperator area. In approximately 1955 the owners at that time reforested old fields on the 58 acre parcel west of the Gully Road. Even with low cost seedlings from the State Nursery it must have been a very large project for them to undertake. They planted a variety of species, most of which are well adapted to the soils on this property. About 15 acres are good quality plantations now. In about 1976 six acres of old field were reforested on the Federal property. The already existing woodlands on both properties were sugar maple and white ash with some other species. A small area (several acres) on the Gully Rd. property was selectively harvested about 5 years ago. There are valuable timber stands on both of these properties. The soils here are silt loams which are modreratly well drained for the most part. The soil on most of the of the property is Honeoye silt loam. The flat between the wetland and the slope to the east of it is Farmington-Aurora Association. This type is shallow to bedrock and well drained. The shallowness and dryness can limit tree growth in places. The forested slope to the east has Honeoye, Lansing, and Ontario soils which are very steep. There is a significant potential for erosion on these slopes (stands 16 , 22, 23, and 24). These recommendations are made assuming that the owners have the underlying goal of wise use of land while protecting it from damage which would permanently reduce its ability to provide all the different benefits which forest land provides, both to the owners and to society in general. Long-term sustained yield is a part of this. Recommendations for timber management are made on an “even flow” basis to the extent possible given the present condition of the forest. For many of the forest stands on this property “even flow” simply isn’t possible without significant sacrifice of both timber income and benefit to future generations. This is a situation given to us by past land use. Most commonly accepted economic analyses consider financial maturity of good quality trees of high value hardwoods like sugar maple, yellow birch, and black cherry to be 18-20 inches in diameter at breast height. Until they reach that size, they are probably increasing in value at a rate of 8-10% per year (providing that they are thinned out for fast growth). Financial maturity for firewood is about 11 inches in diameter. Proper timber management has the goal of increasing the overall rate of return from the timber stands on the property which means cutting the low grade firewood at every practical opportunity. Firewood quality trees take up growing space but increase in value at less than 2% per year. They should be weeded out as soon as possible if the owners are thinking about the future usefulness of their land. Timber stands described in the 2002 Forest Stewardship plan drawn up by DEC forester Charles K. Porter. Note that his survey was conducted around the time that the Guppy Farm was purchased, but before the Pitman-Atkins and O’loughlin properties were acquired. Understocked: the stand would lose growth by not having enough stems to adequately utilize the growing potential of the site. Overstocked: the stand has too many stems in competition, and a corresponding reduction in the growth rate. Well-stocked: the stand represents a somewhat ideal density for realizing the growth potential on a site. 1. Small sawtimber sugar maple, white ash, hickory, basswood, overstocked, good site, good quality, 9 acres. This stand could be managed under an uneven age forest managed system. The stand is probably even aged (the result of a clearcut in the past) but , considering that this is public property and will be used for recreation , aesthetics may be more important. There is some good timber here at present. If the stand is carefully marked by a forester for a harvest, it could become very valuable in the future. To properly treat this stand , it is necessary to harvest trees in both the sawtimber size class ( 12″ and larger) and in the pole size class. A harvest of sawlog trees only will not prepare the forest for a high level of sustained yield into the future. A harvest here should include some smaller trees useful for firewood only. This will make the timber sale slightly less desirable to timber companies and loggers but it is something that you can do to make things better for the future. 2. Sapling sugar maple, white ash, apple, grapevine, buckthorn, understocked, probably a poor site, unknown quality, 5 acres. This is a flat area which is not well drained. This was pasture recently. It may be that the grapevine and buckthom will be replaced by healthy forest trees in the future or this area may be a poor site. No recommendations here. 3. Sawtimber sugar maple, white ash, beech, basswood, overstocked, good site, good quality, 8 acres. This stand is older than stand #1 and slightly poorer in quality. It appears to have been grazed more heavily. The recommendation here is a harvest under uneven aged management. Some of the large culls should be cut and it is again necessary to harvest some trees in the pole size class also. 4. Open, shrub, sapling, 1.5 acres. This is an old house or farm site. It is filling in with trees. It is possible to keep this area open by cutting hardwood trees. That would maintain this area’s value as a wildlife site. Open areas surrounded by forest like this will become more valuable in the future as abandoned farmland reverts to forest throughout the county. This area is also useful as a parking area for people using the land for outdoor recreation. Since this area would be used for a landing (a place where the trees are skidded to for loading onto trucks) , the timber harvest will provide an opportunity to improve this for public convenience and safety. 5. Pole sugar maple, white ash, scattered red pine, overstocked, good site, excellent quality, 14 acres total. This stand is about 50 years old. On 1950 aerial photos it looks like it must have been a pasture. At present it is a high quality even aged stand with a few patches of red pine scattered in. It is generally recommended that even aged stands be treated under an even age silvicultural system. This stand needs a thinning (called timber stand improvement), the trees are too small to think of harvest yet. A commercial thinning will double or triple the rate of diameter growtl1 and the trees which will have select grade and veneer grade logs in them will be chosen to grow into crop trees. The lumber-off it could provide many people with beautiful furniture and hardwood floors. The future value of this stand could easily be many thousand dollars per acre if it treated properly now. It is also possible, by thinning properly, to retain species like black cherry and white ash which are intermediate in shade tolerance. The same considerations for the future apply here as in the sawtimber stands. Even age management leads to some kind of overstory removal eventually. It is possible to convert the stand to an uneven age stand but there is a large cost involved. I would like to recommend an even age thinning now, with the plan being that there will be another thinning in 15-20 years time. The harvest beyond that could be a heavy cut leading to a two age class stand or it could be a classic even age shelterwood with overstory removal in another 10 years time. If the owners decide that they would like to convert this stand to un even age, then the recommended management would be to harvest the trees in patches covering 1/5 of the acreage of the stand to establish a new age class of trees including some species intermediate in shade tolerance. In 15 or 20 years another area of the same size would be harvested. The problem is that the present harvest and the next one would be of relatively low value, immature trees (firewood). But those same trees have very high investment potential and would be worth a lot of money if they were properly thinned and allowed to grow into large sawtimber. Under uneven aged management the owners in the future would not have nearly as great a timber income off this. The high value timber sale in the sawtimber stands can be used to get this stand thinned out properly. By including the firewood trees which would be marked for thinning in this stand in a larger timber sale you could get it taken care of. There is a cost to this. It is probably true that it will lower the value of bids received for the timber sale. But, experience shows that, if owners go along with the idea that the thinning can be accomplished by a separate low value sale of firewood later on, then the job usually never gets done at all. It is expensive to hire a competent forester to mark and administer a sale. Firewood is not in demand so it is difficult to sell. There are always people around who say they would be interested and will cut it but they don’t usually show up when the time comes to put up the money. I recommend including it in a larger timber sale. 6. Plantation Scotch pine, red pine, pole sugar maple, white ash, overstocked, good site, good quality, 5 acres. 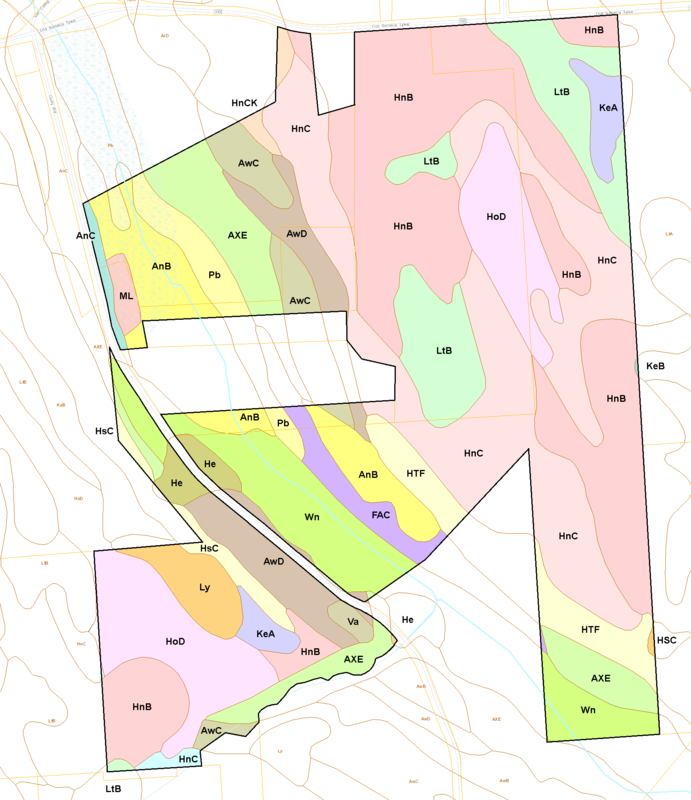 [The following paragraphs also apply to stands #8, 9, 10, and 11, which together with stand #6 have a total of 14.5 acres.] It appears that the plantations were established around 1955. These stands should be thinned as soon as possible. They are the next highest priority after the pole sized hardwood stands. Actually the red pine plantations are biologically in much greater need of thinning but the hardwood stands would be such a good investment that they come first. Red pine is different from the other species. It is genetically very uniform. Red pine is like carrots in a garden, they are deliberately planted thick and if you don’t thin them out the result is many runty, weedy trees and no large, useful trees. In a few more years they will be in poor condition and in desperate need of thinning. This is an good site for red pine and many trees are of such good quality that they will meet utility pole quality standards in the future. We know from what is happening now in plantations established by the Civilian Conservation Corps in the 1930’s that red pine on soils like these stops growing and starts to decline at age 70. These are 45 years old and they need to be thinned out so that they will be large enough to be useful before they reach that biological limit. As an investment, these stands would be a good one if they were thinned out properly. Thinning will double or triple the rate of diameter growth on the best quality trees. Scotch pine will probably never have the value that red pine will. They should be thinned out also but always favor other species over Scotch pine. These plantations are overdue for thinning and tree growth has been hurt by overcrowding. There is no real commercial market for softwoods of this size. Possibly there will be a federal cost-sharing program next year. Those programs usually reimburse landowners 65-75% of the cost of doing forest improvement work. Cutting approximately half the trees will be a lot of work and will create an awful mess for a few years but it is necessary in this case. Girdling the trees with a chainsaw is much less work but the trees are weakened and will snap off in a wind storm or a heavy wet snow. They will very likely take a patch of good trees with them in a domino effect. 7. Deep Gully, sawtimber sugar maple, basswood, overstocked, good site, good quality, 7 acres. This is far too steep to harvest anything but those trees which can be reached from the top. Driving a skidder down the creek at the bottom of the gully would be a real mess. It may be that it isn’t worth harvesting here, there is a trail along part of the edge of this gully and the gully looks good. 8. Plantation red pine, Norway spruce, white pine, pole sugar maple, overstocked, good site, good quality, 2 acres. See stand #6. 9. Plantation white spruce, Norway spruce, red pine, Scotch pine, pole sugar maple, white ash, overstocked, good site, good quality, 1.5 acres. See stand #6. 10. Plantation red pine, pole sugar maple, overstocked, good site, good quality, 3 acres. See stand #6. 11. Plantation white pine, red pine, Norway spruce, Scotch pine, pole sugar maple, overstocked, good site, good quality, 3.5 acres. See stand #6. 12. Pole white ash, green ash, sugar maple, red maple, black cherry, hickory, overstocked, good site good quality, 3 acres. Parts of this stand are wet but most of it is capable of producing useful timber in the future. Recommend a firewood thinning here. Favor cherry and sugar maple over the other species. 13. Pole ironwood (eastern hophornbeam), sugar maple understocked, good site, fair quality, 3 acres. This is a low density stand. There is probably enough sugar maple here to make a fully stocked stand in the future but it is not ready for thinning now. Recommend thinning in 10 years time. Until then it would be useful to leave the ironwood as “pruners” for the sugar maple. 15. Old field, buckthorn, apple, thornapple, sapling white ash, 4 acres. 16. Sawtimber sugar maple, overstocked, good site good quality, 7 acres. This is a stand of valuable timber. I recommend a harvest under uneven aged management. This harvest will start the process of converting the stand to uneven age. This stand is one of the ones which is steep and has silt loam soils. More than normal care needs to be taken with harvesting equipment here. This area could easily become a problem. Recommend that harvesting be limited to the dry time of year. 17. Sapling white ash, red maple, overstocked, good site, good quality, 7 acres. This is old field which has seeded into ash. In the future it will need to be thinned out. 18. Buckthorn, sapling, white ash, red maple, aspen, understocked, good site fair quality, 5 acres. This is old field which appears to have been used as a source of fill. No recommendations now. This area will need to be looked at in 10 years time. 19. Plantation red pine, 1976, slightly overstocked, fair site, fair quality, 3 acres. This red pine was planted on a wider spacing than is currently recommended. These trees will probably not have small enough limb stubs (knots) to be of utility pole quality but they will make useful construction lumber for homes and buildings. Because of the wide spacing there are a lot of ash saplings mixed in. These should be cut to release red pine from a competition that it cannot win. Thinning is recommended in 10 years time. At that time the ash should be cut, otherwise this stand will become another old field hardwood stand like all the rest of this area. Evergreen forest areas have value for aesthetics and wildlife. It may be that this property will be more heavily used by the public for recreation in the future and having evergreens will make it more attractive. 20. Sapling white ash with some red pine, larch, white spruce, overstocked, good site, good quality, 3 acres. This is old field which has seeded in to ash. They must have planted in a brushy area that had ash seedlings mixed in. Recommend thinning in 10 years to release red pine and white spruce. Larch is a conifer which loses it ‘s needles in the fall so it has limited value for wildlife. They are colorful in the fall for a short period before the needles fall off. The needles are bright yellow. 21. Plantation scotch pine, red pine, white spruce, 1976, sapling white ash, overstocked, good site, good quality, 3 acres. Recommend thinning in 10 years time. 22. Pole sugar maple, white ash, basswood, ironwood (eastern hophornbeam), black cherry, overstocked, good site, excellent quality, 4 acres. This is a nice pole stand which is the result of a clearcut about 50 years ago. The same considerations apply here as in stand #5 on the Gully Road property. See stand #5 description and recommendations. This stand is steep though. This is the same slope as stand # 16 and there i s a concern with erosion getting out of control here. I would like to recommend that this stand be thinned out as part of a sawtimber sale in stands #16, #24, #25. It is too steep to be thinned by someone cutting firewood and using a farm tractor. It would be dangerous and very much more likely to result in erosion. 23. Sapling sugar maple, ironwood, black cherry, basswood, hickory, white ash, with patches of brush and grapevine, variably stocked, good site, good quality, 6 acres. There are large patches of grapevine in this area. Part of this stand is on the flat at the bottom of the slope and part is on the slope. I recommend thinning this stand in 10 years time. 24. Sawtimber aspen, pole sugar maple, overstocked, good site, good quality, 1.5 acres. The recommendation here is to thin the aspen commercially as part of a timber sale in the other stands. 25. Sawtimber sugar maple, hickory, black locust, basswood, white ash, butternut, overstocked, good site, good quality, 2 acres. Recommend a harvest under an uneven age management system. Old fields naturally fill in with brush after they are no longer grazed. Pioneer hardwood tree species like white ash, red maple, grey birch and aspen seed in and will become the future forest. Unfortunately these species aren’t very desirable either for looks, timber or wildlife. As far as timber value goes, soft (red) maple and aspen are low value. Red maple which seeds in on old fields is usually heavily infected with sterile conk heart rot and will never grow into good sawlog trees. Wildlife of all sorts benefits from having thick areas of evergreens for cover from weather and predators. Most species from deer to songbirds will increase in numbers by having softwood cover. This area is rapidly going to brush but there is an opportunity to establish some thick evergreen cover for wildlife. Having some blocks of evergreens makes the land look better, especially in the late fall, winter and early spring when the hardwoods don’t have any leaves on. If possible, keeping some areas open by mowing every year would be a good idea for wildlife, for aesthetics, and for atmosphere. The recommended management for old meadows and pastures is to reforest them with pine and spruce. These species cannot be planted if hardwood seedlings have already seeded in. The low value hardwoods will choke out the pine because for the first few years the pine grows slower than the hardwoods. Planting pine or spruce will make the pasture look better and will be of great benefit both for wildlife and for future timber. If we allow the pastures to go to brush and eventually to tree seedlings it will be many years before they produce even small firewood. In a year, there may be a new federal cost-sharing program which will reimburse a large percentage of the cost of reforesting some parts of these areas. The species recommended for this property are white pine and Norway spruce. We have the benefit of seeing which of the species planted in the past have done well here. 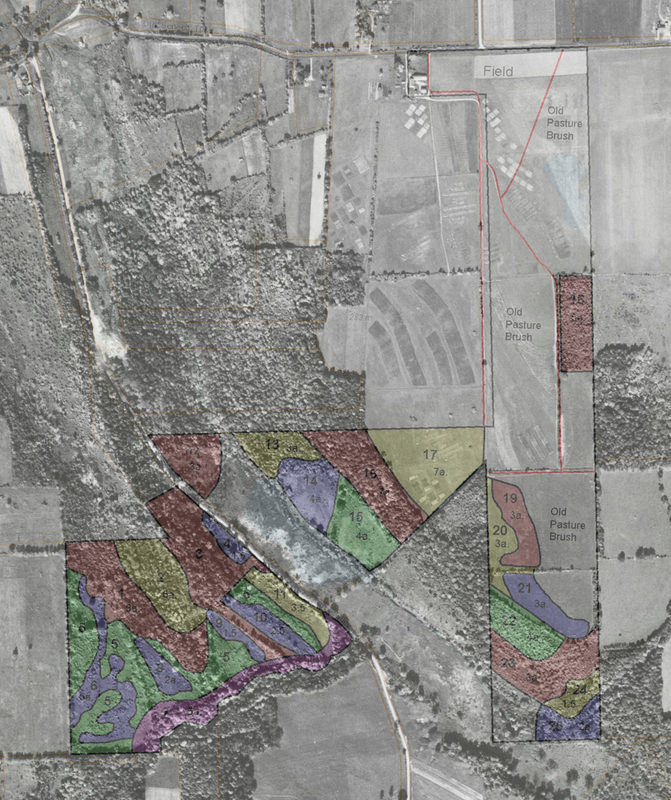 2002 tree survey overlaid onto 1951 aerial photo of the Federal Farm and Gully Road area. Mr. Porter did not list white oak as a component of any of the stands, though he did mention it in the introduction. It does seem to be prevalent in stand 14 and/or 13. Stand 13 seems have an overabundance of beech seedlings or resprouts. It’s not clear whether this is due to beech bark disease or perhaps the beaver activity in that area. This plan was published in the same year (2002) that the emerald ash borer (Agrilus planipennis) was first discovered in North America (in Michigan and Ontario). So understandably, EAB wasn’t mentioned as a threat to our ash tree population. However, it has now (2014) infested ash trees in the northeast part of Onondaga County and the western part of Cayuga County. We are only about 20 miles from each of those infestations. So this insect may take care of some of the timber-stand thinning for us. Another tree not mentioned by Mr. Porter is Eastern hemlock, which is prevalent farther north along the east side of Gully Road than this survey covered. Some Hemlock is present on the Pitman-Atkins and O’loughlin properties, which the town now owns, but more is present on the Chapman property between them, which the town does not own. Hemlocks are also present in stands #24 & #25, but not mentioned by Porter. Hemlocks are threatened by the Hemlock Woolly Adelgid, which was discovered near Carpenter’s Falls in 2013 and has since reached the southern Skaneateles Lake shoreline. Infested hemlocks usually die within 4 to 12 years. Sycamores are not mentioned by this plan, but are present in stand #23 and/or just south of it.